I’ve always been idealistic. 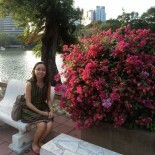 I think it is the one thing in my life that I really want to maintain. I don’t want to end up jaded in the years to come. I want the belief that things could always get better, even if they’re already pretty great or even when everything seems hopeless. It is not about never having satisfaction, as I feel good and satisfied with my life. But we should always work towards a better possibility—not just for ourselves but also for society. This idealism extends to my concepts of romance, especially as I compare it to what society expects romance to be. A few nights ago, we dined at what was popularly touted as one of the “most romantic restaurant” in the metro. I’ve wanted to dine here for some time now but I’ve been skeptical about it. When we found a coupon, we decided to go for it, just because. Please take note that what I write is not a take down on the restaurant (the food is quite good) but a reflection of what romance is and how its projected to be. The place feels like what romcom movies and novels are made of. There was a house transformed into a restaurant and gazebo in the garden. There was a pond with koi fish and a fountain. Each gazebo has curtains that you can draw close so you can dine privately. The table was strewn with rose petals and candle-lit, more rose petals encircle the table. The servers were dressed properly and would pour you a glass of wine when you get there. Perhaps all you need is a violinist playing, an engagement ring, and a camera—and The Bachelor episode would be complete. Traditionally, this is what we are taught to yearn for. For years, the concept of a romantic restaurant, of wining and dining, is something that you would look forward to when you start dating. Perhaps that dating would turn into a romantic proposal and engagement, and eventually into a grand wedding while wearing that puffy white dress. Yet, looking at all of this with a critical eye, all the bells and whistles are just performances, rather than real romance. In reality, it feels cold and empty, almost ordinary. I ask myself, “how did these expectations come to be?” How did these images become ingrained in our minds? The roses and candles, where did all that come from? Is it the material condition that we are situated in? I remember the lecture I gave more than a year ago about the images of love in art. I started with Auguste Rodin’s The Kiss, placed in park in Paris and how you should place your hand upon it and make a wish for love and it will be granted. At one point, everyone yearns for love and romance. As Barbra Streisand once delivered in The Mirror has Two Faces, “Because while it does last, it feels great.” But what kind of love and romance do we look for? Our present-day love and romance has a deep history in materiality. 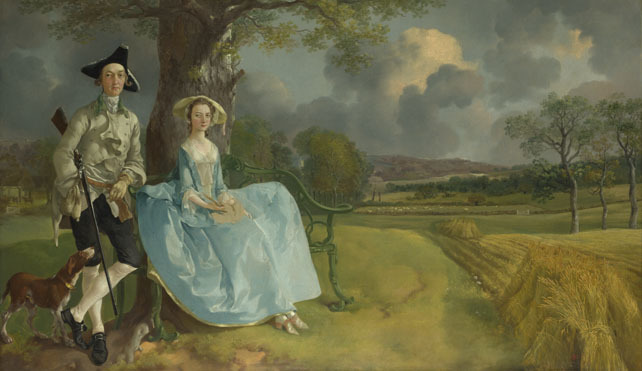 One of the most memorable image I used in the lecture is Thomas Gainsborough’s Mr and Mrs Andrews. Looking at the surface, it looks like a traditional portrait of the couple that optimises the rule of thirds. But historically, the landscape dominates because it is the actual property of Mr Andrews and that marriage to his wife added to that property. It is a well-executed painting that gives a visual representation of what marriage and romance was and in some cases, how it still is—an exchange of goods and property. This article is not an “I am better than you” article. If traditional romance is really what you yearn for, then it is what it is. But I want to open up the possibility that there is something else out there, maybe something better. Roses and candles isn’t the end-all and be-all of romance. When Jane Austen started writing romance novels, she proposed the concept of romantic love that could conquer material conditions. This enabled Mr. Fitzwilliam Darcy and Elizabeth Bennet to marry. He eventually found her intelligence and spirit to have more value than her dowry, while she eventually liked him when she discovered he has a fine and quiet taste and sincerity behind the snobbery and great wealth. Romance, ideally, is not about material objects that are given and exchanged. Perhaps for most of us, romantic love may not equate to a joining in union of a huge property, as in the case of the Andrews. But romantic relationships still demand material conditions to be fulfilled—roses, candles, romantic dinners, etc. Is romance outside of such material conditions possible? Can we go beyond traditional expectations and create conditions according to our definitions? Jane Austen certainly thought so, when she imagined the stories of her heroines at a time that romantic love was deemed ridiculous. Now that we know that romantic love can exist, why do we allow material conditions to continually dictate it? More importantly, is there a way for us to change the social condition that creates such material expectations? I would like to imagine that it is possible. **And just an end note, I did place my hand on The Kiss and wished for love. Less than a year later, I found it. Luckily, he doesn’t mind that I postulate such questionings on romance, love, and relationships. This entry was posted on March 27, 2015 by Portia Placino in Curated Art And Images, Portia's Narratives and tagged art, romance, sculpture, thoughts.